Hello, boils and ghouls! October is upon us and that means one thing: HALLOWEEN! While most holidays get a measly day or two of formal recognition, orthodox Monster Kids prefer to celebrate it in the tradition of our people: By watching tons of horror movies. This month at THE COLLINSPORT HISTORICAL SOCIETY, we're going to be discussing some of our favorites every day until Halloween. So, put on your 3-D spex, pop some popcorn and turn out the lights .... because we're going to the movies! Why do I love THE BRIDE OF FRANKENSTEIN? Why do I contend that it’s the greatest horror movie ever made? The film is about friendship, and like LOST IN TRANSLATION, it conjures up that dull ache of friendlessness in even the most gregarious of popular extroverts. But, as Roger Ebert pointed out, no great film is ever truly depressing. Although BRIDE explores loneliness, and although it conjures up the feeling with poignant immediacy, it still overwhelms the alienation it creates. That’s James Whale’s real brilliance. We open with Mary Shelley (who also plays the Bride, looking every bit the knockout as both). To entertain her friends, she continues her Frankenstein saga, describing the creature’s survival from the torches and pitchforks. So does his creator (the unforgettably anguished Colin Clive). As both recover, creature and creator are separately contacted by the perverse, old mentor of Dr. Frankenstein’s, the unforgettable Dr. Pretorius, played by the equally unforgettable Ernest Thesiger. 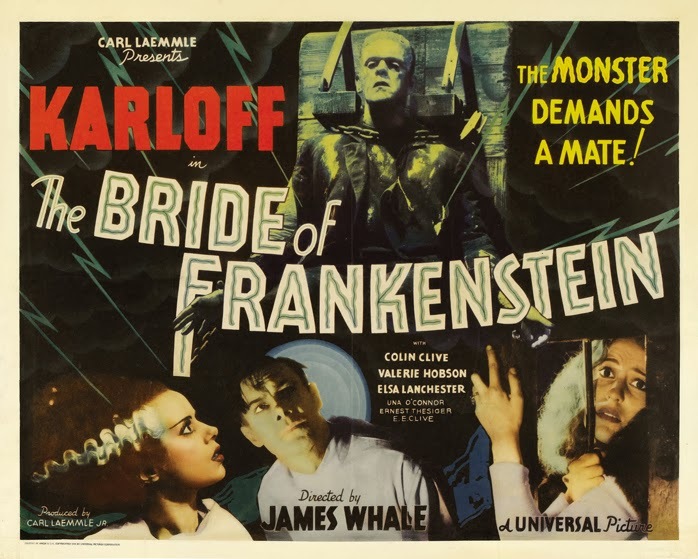 Intent to see a female creature as well as a male, Pretorius arranges the kidnapping of Frankenstein’s love (the human chiffon of earnest Valerie Hobson) and the thuggery of the creature to coerce the doctor into recreating his experiment. The resulting Bride hates the creature as much as anyone. Realizing the unnatural hopelessness of his Bride’s future, his own dark fate, and the evil of Pretorius, the creature destroys the lab. Dr. Frankenstein and his actual bride escape, and we can only hope that a lesson has been learned. It should be a helluva downer, but Whale’s story — and, more importantly, Karloff’s performance — generates a greater realization. I walk out of BRIDE knowing that everyone feels misunderstood. Everyone is in need of a friend who both accepts and “gets" them. There are many times in life when we don’t have them, but that’s a sad fact mitigated by our unity in longing. Anyone who really pays attention to BRIDE identifies with the creature. In one of the single finest performances ever captured on film, Karloff represents all of our longing, all of our simple joy, all of our optimism, and in the end, a determined and brave wisdom to which all of us can only aspire. By that, I hardly mean that we should touch that lever and blow us all to atoms. However, the creature does realize his own dignity, autonomy, mercy, and sense of justice. In a film of geniuses, the creature finally becomes the benevolent father to the man. Frankenstein and Pretorius created lives where none were necessary. The creature, now the sage, ends those lives when it is not only necessary, but perhaps crucial. His evolution to this state is a the kind of journey you’d expect the WPA to have immortalized with a train station mural. The film treats us to Bavarian rednecks (shamelessly represented by the uproarious Una O’Connor), gun-toting xenophobes (one of whom is the unthinkably young John Carradine), and manipulative deviants (Thesiger and the returning Dwight Frye), set against stark forests that seem immolated by an apocalypse. Alternately, the creature enjoys nature at its most verdantly generous and an even more generous friend... a blind and ebullient monk. By this, he knows what is possible in life and gains an understanding that those things are forever out of reach for him. While this realization is shattering, he accompanies it with the exhortation that his creator and creator’s bride should have life and happiness. If his capacity for such an openhearted choice, the creature becomes the friend to Frankenstein that can never be reciprocated. And it needn’t be. That realization of humanity is enough. PATRICK McCRAY is a well known comic book author who resides in Knoxville, Tenn., where he's been a drama coach and general nuisance since 1997. He has a MFA in Directing and worked at Revolutionary Comics and on the early days of BABYLON 5, and is a frequent contributor to The Collinsport Historical Society. You can find him at The Collins Foundation. DARK SHADOWS comicbook sale at Comixology!